Daily Cash Siphon Review: Weird Money Trick or Clever Scam? Have you heard about Daily Cash Siphon and are wondering what the weird trick to make money online it promises is? And do you want to know if Daily Cash Siphon is a scam or if it really offers value? Then this is for you – I have joined the system myself to test what it really offers. In this Daily Cash Siphon review I will give you an inside look, so you can see exactly what to expect and find out if it is worth the investment or not. I was very skeptical before joining Daily Cash Siphon. It, however, turned out to be even worse than expected. Most importantly I did not hear back from support even though I never managed to get access to the members area – I only got access to the sales page that tried to get me to invest several hundred dollars. Definitely NOT a system I recommend. What is Daily Cash Siphon and what does it offer? By just watching the Daily Cash Siphon sales video, it might be difficult to figure out exactly what this system offers and if it will be worth it. It is however possible to spot during the sales video. Here you are told that the secret trick to make money online is through affiliate marketing. Daily Cash Siphon focuses on affiliate marketing. Daily Cash Siphon, in particular, focuses on ClickBank products, which are mostly digital products, and they therefore often offer high commissions to you, if you promote the products. I know from personal experience that it definitely is possible to make money online with affiliate marketing. So it is a real way to make money Daily Cash Siphon is based on. However, if you think it will be an easy way to earn online, you might be disappointed after joining. I joined myself, and you should definitely know what you are getting into before investing any money – so let me explain more about what happens after you join. I have tested and reviewed a lot of online marketing platforms and tools, and I right away saw a lot of warning signs when watching the sales video. For example, the claims that it will be easy to make money online, you do not know who the owner is, that you are not told much about what you will actually learn, and more. I however still decided to join and test it, as I found a link where I could get a free trial. I would honestly never have paid to get access to this program, as it has a lot of warning signs in my opinion. But I decided to then give Daily Cash Siphon the benefit of the doubt and joined. What you find after you join tells a lot about what you actually get and what you can expect. You do not get direct access to the members area after joining. You first have to go through a couple of sales pages. What these explain is very important to understand, to get an idea about what Daily Cash Siphon really offers. Right after you join Daily Cash Siphon, you get to another sales page with another very convincing sales video. Here you are told a little more about what the system really offers. If you thought that you would be able to start making money in just 7 minutes, as you are told on the main sales page, just by getting the regular system, you will likely be disappointed when you get to this page. It is a sales page where you are told you can buy a done-for-you website that can be used to sell the affiliate offers you want to promote. You are told that you will get a lot more than with just the Daily Cash Siphon – with the regular system, you have to do all the work yourself. Now it is revealed that with the regular system you have to do all the work yourself. You are told that you have to build an affiliate blog from scratch yourself. But if you pay another $197, you will get a done-for-you website. In addition to this, there will be a monthly fee of $17 after this buy. I agree that it is great to have an affiliate blog, but it makes we very upset to see that they are selling the idea in the main video that you can get started in just 7 minutes and 19 clicks. When you then join, the first thing you are told is that you have to build everything from scratch yourself – unless you pay another $197. From looking at the sales video and based on my previous experiences, I did expect something like this would happen, but it is still upsetting for me to see sales tricks like this used. But this is not the only sales page you have to go through to get to the members area. The second page you get to is then another sales page with another persuasive sales video. This time it is talking about traffic. And you are told you need traffic to make any real money with affiliate marketing. I definitely agree that traffic is an important part of making money on a website. Without traffic/visitors, you will of course not earn any commissions. You are however not told anything about how they will help you get traffic. I have worked with SEO and organic traffic to websites for quite a while, and I have also worked for several marketing agencies. The thing is that there really is no super secret and fast free way to get quality traffic from what I have experienced. It makes me very suspicious when you are told you will get access to a secret method that will send tons of quality traffic right away. That is not quite how traffic works online. You can get fast traffic, if you know how to set up good ads. But this takes skills and practice and a budget as well, and is not something that will just happen automatically. In addition to these concerns, you have to pay another $97 to get this upgrade. So even before you get to the members area you have to go through these two sales pages with persuasive sales videos and are told that you basically need these upgrades to make it work. That means that before getting to the members area you might end up spending more than $300 + monthly fees. You, of course, do not have to get the upgrades, but the sales pages are clearly made to convince you that they are very important. I was very curious to see what would be in the members area after the upsell pages, even though I honestly did not have high expectations. I could not get access to the members area when I finally got there. I just simply got an error message saying that I used a wrong email even though it was the same email my order confirmation was sent to. I of course right away send a message to the support to ask what was going on and how to get access. Straight away I received an auto-reply saying that they would get back to me within 1 business day. At the time of writing this review, it is now 1 week ago I send a message to the support – I have still not heard anything. So that means I joined, got access to the upsell pages that tried to convince me to invest several hundred dollars – after this I could not get access to the actual members area. This can maybe be because I was offered a free trial, and that free trial only gave me access to the upsell pages – there was however no info about this. In addition to this, I gave them the chance to explain what was going on, but the support did not get back to me. So clearly not a system I can recommend based on these experiences. I just want to make one thing clear – affiliate marketing is definitely a real way to make money online. I know this from personal experience, as I have learned to build successful affiliate blogs from scratch myself. To me it is one of the best long-term ways to make a real income online. Before getting into affiliate marketing, you need to be realistic about your expectations. The reality is that most people fail with affiliate marketing. There are many reasons for this, but some main reasons are unrealistic expectations and impatience. Often because believing programs that claim it is possible to earn a full-time income online with very little effort and without taking the time to learn the skills. This is just not the reality. It definitely is possible to learn affiliate marketing and to make money like this no matter your background. But it will not happen overnight, and it will take some time and effort to make it happen. Any program that promises you can make fast money without any effort by joining them is in my experience a program to be careful about. You can succeed, if you get the right training and are willing to work hard. If you go for the shiny objects, you can instead end up wasting a lot of time joining programs that will give you little to no value. Based on my experience with Daily Cash Siphon and my experience with internet marketing in general, there are some important considerations you need to make before investing in the program. Daily Cash Siphon itself makes it very clear that you will learn to promote controversial offers. Do you really want to build your income on controversial offers? It does not go more into details about what it means by saying controversial, other than you are told it is offers that can give you a lot of commissions. This clearly shows that the focus is not necessarily on how you can promote high-quality products that will help the people you sell to. The focus is instead of selling whatever pays high commissions. Personally, I do not like this approach but prefer what I call honest affiliate marketing, where you focus on quality. What I love about affiliate marketing is that you can actually make money online by helping other people and giving them quality information about topics you are interested in yourself. That is a fantastic combination. But there are already so many affiliate marketers that only care about themselves, how to make a profit, and that do not think about the person buying. This is sad to me, and I do not like this approach. So before getting involved with Daily Cash Siphon, you need to consider what kind of approach you think will be best for you in the long run. Consideration 2 – Are you willing to invest more money? If you want full access to Daily Cash Siphon, it will cost you more than just the initial joining fee. Even before you get to the members area you are pushed hard to buy the upgrades with convincing sales arguments and videos. If you are not willing to invest extra money, you will not get access to everything. Consideration 3 – Are you willing to invest more time? You are told MANY times in the sales video that you can get started in just 7 minutes and 19 clicks. You can supposedly get started in just 7 minutes. This does not mean you will start earning this quickly. If you do not get the upgrades, you have to build everything from scratch. Even with the upgrades, you should not expect to start making the kind of money the sales videos show this quickly. That is just not how internet marketing in general works. It takes time and effort, like it does to create any other kind of income. If you are looking to become rich fast and without effort, you should in my opinion not get into internet marketing. With that approach you will likely end up wasting a lot of money joining programs that promise this is possible. In fact, Daily Cash Siphon itself also says this in its disclaimer at the bottom of the website, where it says there are no guarantees you will earn this amount of money. In the sales video of the first upgrade there also is a disclaimer saying that these results are not average. The disclaimer reveals the examples are NOT average earnings. They are directly saying that these results are not average. You are also told the system is brand new, so average results or not known. Consideration 4 – Do you want to support a program like this? This is a personal consideration that is very important to me. I like making money online, as it gives a lot of freedom. But doing it with integrity is important to me. I hate when I see programs promise a lot of fast money for a small cost, just to see that it is a way to get people into a well-optimized sales funnel to sell a lot more expensive programs. I do not want to participate in this, and I do not want to support programs that use these methods. That is also why I am not promoting this kind of programs here on OnlineZerToHero.com, even though I could earn high commissions from it. Daily Cash Siphon itself says that it will teach you to make money in a market that is barely ethical. Do you want to make money by doing something that is barely ethical? Is this a kind of program you want to get involved with? To me, it is important to consider what kind of approach and what kind of programs you want to support online. Maybe it is not important to you, but wanted to put it here anyway, as I think we will all benefit from introducing more quality in internet marketing, and I hope more people will focus on this over time. If you do not have much experience in making money online, it is important to be able to get support, when you first start. 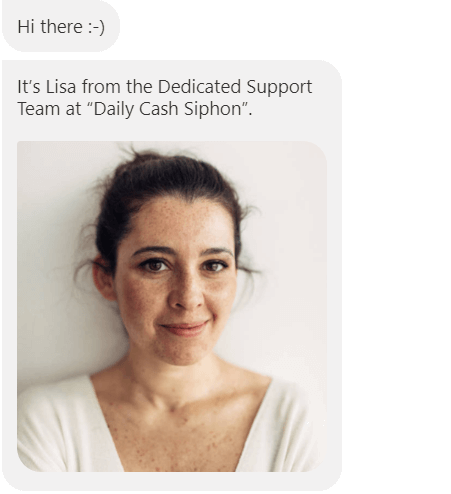 As I have already mentioned, I have very poor experiences with the Daily Cash Siphon Support, as they did not get back to me even with something as important as being able to get access to the platform. So even if you are luckier and they will get back to you, it does in my opinion not seem likely that you will get fast support. In addition to this, I spotted another red flag about the support on the website. When you come to the website, there is a live chat option. Example of the “live” chat on Daily Cash Siphons’s website. Here there is a picture of Lisa from support. This is however not a real support member. I did an image search, and the same image showed up on many websites, including two stock photo websites. The photo of the support staff seems to be from a stock photo platform. The image of the support staff might be different from time to time or depending on the country you enter from. But the ones I have seen can all be found on stock photo platforms. So not only do you not know who the owner is, but Daily cash Siphon is also using stock photos to represent the staff. You have to ask yourself why it is so secret who is behind the program, and why are they not more transparent about this? From my experience with Daily Cash Siphon, I think it is pretty clear from this review that it is NOT a system I recommend. But let’s sum pros and cons, so you can get a better overview of why this is. I honestly have had a very poor experience with Daily Cash Siphon. I was very skeptical before joining, but as I could get a free trial, I decided to give it a chance. That was a waste of time. All I got was access to a couple of sales pages that wanted me to spend hundreds of dollars. I never got access to the members area, and when reaching out to the support, I did not hear back from them. In addition to this, I have years of experience with affiliate marketing, and I know it takes time, work, and effort to become successful, and that no system will be able to take care of everything for you. Therefore, Daily Cash Siphon is definitely NOT a system I recommend. As already mentioned, affiliate marketing is a real and legit way to make money online. I know this from personal experience, as this is how I make money online. You just need to know that it will not happen automatically and without effort. If you are willing to make an effort to make it happen, you can check out my FREE guide with the exact steps I have used to create a full-time income. It even shows you a completely free way to get started, and it is all about creating a REALISTIC income online based on real skills and not hype and exaggerated claims. So if you are interested in affiliate marketing, you need to click the link above and check out the free guide to get started. If you have any comments, questions, or have any experiences with Daily Cash Siphon yourself, I would love to hear from you in a comment below. Thank you Celeste. Glad my article helped you. A very good post because I am also one of the victims on such scammers. There was a program where you had to keep on visiting other’s website to earn cash. I worked very hard for few hours and upon trying to claim the money, a thought sudden struck my mind(Is this a scam?) when it asked for my credit card and personal information. I removed my information and quit from the page immediately. Fortunately, I put a stop to it and did not move on further. Sad to hear the story but I have to blame it on my greediness. There was another one where after signing up and no action done on my part, they kept flooding my email box to persuade me to continue.There is no free meal in this world. Only unconditional love is free. Also, there are a lot of other programs with upsells after your ‘click’ and most of them are normally high ticket items. You have done a very detailed article to help and warn people of such scams. If there is more of such reviews, it will be very beneficial to the societies. Seems like we need more avengers like you to stop the villians from harming the world. On second thought, I am thinking I should also join forces to kick out all the jokers but I need to complete my training first. Lol. Sorry to hear about your past bad experience Terand. But thanks for sharing – we definitely have to be aware online. Daily cash siphon seems to be a flat out scam from what I inferred in the review. I’ve had experiences with such sites in the past. You’d be lucky if they replied you. This kind of schemes always try to get more money from you. They trap u with promises of easy money. And to think one couldn’t log in after purchase is already a red flag not to purchase any other product offered. I honestly did not expect much from the training before joining, but not being able to access the platform still surprised me. And also a bit surprising that I have not at all heard back from the support. So definitely not a site I have good experiences with.